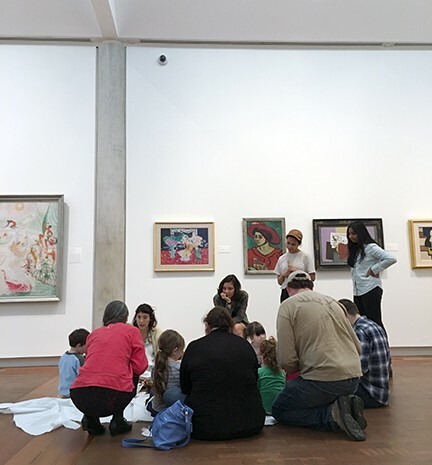 A group of preschoolers gathered on a magic carpet at the foot of a painting by Matisse. They had read The Iridescence of Birds, a story about the artist as a boy, and explored some nearby galleries in the permanent collection, looking for animals in the famous works of art. Now the magic carpet (a white drop-cloth) was flecked with boxes of colored pencils, foam shapes, and little white paper plates. There was going to be a parade when the children finished their animal masks. It was story time at the Frances Lehman Loeb Art Gallery on Vassar College campus in Poughkeepsie, and it’ll come again when the second and third art-related programs for preschoolers are held. Storytime in the Museum is a series of three sessions, each focusing on a different theme. The May session, Astronomy and Art ties into the Art Center’s special exhibition, Touch the Sky. The June session’s theme is Lines and Shapes in Art. "These programs are a wonderful way to expose very young children to art and art museums, but in the comfortable format of story time that so many children are familiar with," says Margaret Vetare, coordinator of public education and information for the Art Center. "We're excited to help introduce kids to the visual delights of an art museum and to do that through an age-appropriate set of activities (and appropriately brief visit) so that they associate museums with fun and comfortable places to be - maybe setting them on a lifelong course of embracing art." The Frances Lehman Loeb Art Center, founded in 1864 as the Vassar College Art Gallery, is a 36,400-square-foot facility which features approximately 350 works from Vassar's extensive collections. Charting the history of art from antiquity to the present, there’s an important group of Hudson River School paintings and a wide range of works by major European and American 20th-century painters. Families can explore it all before or after the story time. 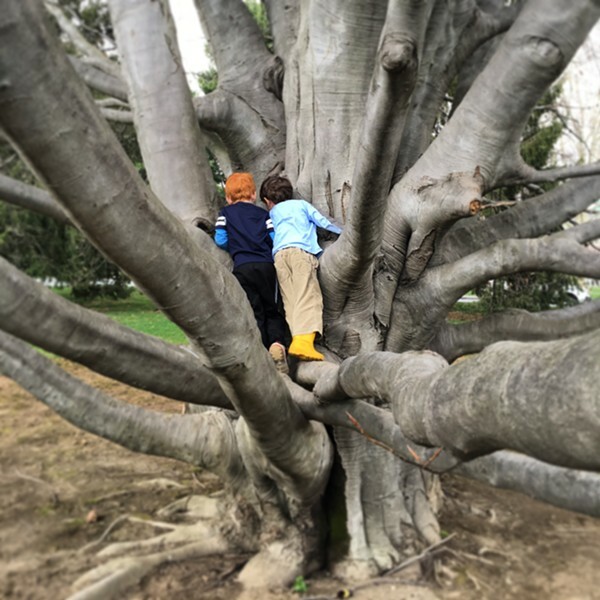 And don’t miss the awesome climbing trees on the lawn just outside the museum! Storytime in the Museum at The Frances Lehman Loeb Art Center at Vassar College, 124 Raymond Avenue in Poughkeepsie: May 13 and June 3 from 1:30pm to 2:15pm; ages 3-5; free. No pre-registration necessary. The Art Center is located at the entrance to the Vassar College campus and open to the public most days. Parking is limited, with visitor parking marked on campus roads, and available in the North and South parking lots at either end of the college campus, just a short walk to the Art Center. For more info, check out their website or call (845) 437-5632. Ask about their groups for kindergarteners.